The Bose Lifestyle 28 system offers a sleek solution to all of your home theater needs; the only other component you have to add is a TV! The sound of this system's five tiny speaker arrays and hideaway Acoustimass bass module will amaze you, filling your room with deep, rich Bose sound. New technology in the bass module delivers impressive clarity at the lowest frequencies, even at the loudest listening levels, and automatic tonal adjustment ensures the right amount of bass when switching between movies and music. They make a wonderful demonstration that allows the salespeople to pull a fast one on the casual purchaser. CAVEAT EMPTOR. Function and sound are worthless. "Sell the sizzle, not the steak." I purchased a Lifestyle 25 system. 1 Center plus 4 surround double-tweeters w/subwoofer and CD changer/main unit. Had it professionally installed. This unit took us away from being music listeners. The base is huge, much harder to hide than you would ever imagine. The CD changer is total garbage. It's been in the repair shop 90% of the time that I own it. On the rare occasion that it works the mechanism is so loud it is distracting. The treble and base are only adjustable from the subwoofer, not by remote control. There is no balance or fade adjustment. The soundstage is next to nothing. We have been miserable with this unit since the day we turned it on. We've discussed this with other Bose customers and have read about their newer products and have found them to be equally unhappy. I wouldn't go near this company again. Sure, they repair the unit every time I bring it to them. How nice. It generally stays repaired less than a week. No HDMI and Component connections. If you are a casual listener like me then trust my word and go get this. Nothing can come close in terms of size, style, performance and brand recognition. The only problem here seems to be the price. If it were available for $1000 then nobody would complain, only because it is expensive that people tend to have a polarized opinion. I considered Denon receiver, Paradigm speakers and other options but for my purpose of movies and some TV it did not make a difference. The bass was enough for what I was watching, I have stereo speakers that provide more thumping bass but the music is not as sweet as the bose. Reading DVDs is a general problem across all top brand DVD players, Sony would not play some DVDs while a low end Coby or Zenith would play anything you put in. Maybe bose will rectify it soon. Small package and Bose brand name. No HDMI or component interfaces. I just purchased this product after debating and experiencing various options including a Denon Receiver and Paradigm speakers. If size, style, convenience are important and you are a casual listener like most out there and not a AudioPhile then you will not notice any difference and in fact you will love the Bose more than the other setups. I have a friend that bought a Bose and complained about low bass but did not change the default bass setting, since it can be done only on screen and there is no seperate control or knob for bass and treble control. Most people do not like it and hate it because of the price, if it was available for $1000 or less then it is no longer a problem. As someone pointed out if Bose was using low cost parts and is selling just by marketing it would have gone out of business in no time. Bose has a brand value and they are cashing on it. No matter what, Bose is more recognizable for a common person than any other brand out there and they charge for it. So if you have the money just buy it. Bose sound life-like, if you like the regular stereo sounds Bose LS S III is no for you. I compared the bose with other top rate system (sony, denon, monitor audio speaker, yamaha, onkyo) and belive me for my ears bose sound better. does not work with all the DVDs. I love my LS28 when it is working that is. It does not play many of the original DVDs which play on my other home devices. Does anyone know if there is a Bose firmware upgrade available to fix this problem? Bose reminds me of my old Mercedez - great when it run. I have a couple reviews here that, after reading, were not as concise and accurate as they should be. So let me clarify some things about this system. 1) I have had problems with the CD/DVD player. It works most of the time, but like others, it does have problems. 2) The Bass and treble are adjustable from -14 to +14, but you need to do that on screen in your TV, or you cannot adjust it. 3) Yes, after tuning the system, it has tons of deep, rich bass and the highs and over sound of the cubes are very good. You can adjust the center cube -7 to +7. You can also adjust the Bose Patented surround sound the same. 4) Customer service is great. If they do work on your system, the warranty starts over for an additional year. You pay no shipping either way. If you need an original box to ship any part back, they will send that to you free of charge. 5) I have no problem with this system, except the poor performance of the CD/DVD. Design is incredible, very samll, very good sound. Onscsreen Treble and Bass adjustment, and everything else. Sleep timer. Digital audio in, etc. Really crappy CD/DVD player. Pretty much useless in many cases. Bose Lifestyle 28. Many people don;t like these media centers, but you'll have to judge for yourself. I relaly like the concept, and to my ears the sound is damn good for such a tiny system, and sounds as god as systems much larger. I have, however, had miultiple problems wiht the CD / DVD player. I've had to return the unit twice, and it still isn't right--at least on DVDs. I keep getting "cannot read disk" errrors. This means in the niddle of a movie, you will need to eject the disk and goto jsut after the spot it will not read. Then try to get it as close as possigble and resume watching. This was the same type fo error I was getting with both the media centers I had to return. The problem is that teh CD/DVDs are junk at its finest. They are noisey, unreliable, and cheaply made. My 60.00 Plextor CD/DVD burner sounds and reads much better. The reason I know it's a Bose prolbem is becsaue I can take the same disks it cannot read, pop them into my 60.00 dollar PLextor in my computer, and they will play perfectly. So beware. I have finally jsut gotten tired of it and bought a multichanger disk/DVD player and plugged it into teh AUX outlet. Never have a disk cannot read error now. So what you will get for paying 2300 dollars for this system is a nice design in all ways and good innovative sound--which is good, no pretty great, and don't let people tell you otherwise, just hear it yourself. You will not get a reliable CD/DVD player. Customer service is excellent--see below. This is a VERY strong point from Bose. I guess wiht the money they save making crappy CD/DVDs, they put that in customer service. All of the reps I had were very knowledgable about my system. They were up on the errors and how to "fix" them, or so they say they fix them. Bose pays for shipping back to them and even sends you ouit a box and foam that fits your specific return module--speakers or the media center. This is all free. Then they give you a sticker that you put on the return box and shipping is paid back to them. Repairs are very fast and shipping both ways is 2 day air. This is the kicker--if you have a unit repaired or a new one sent out, Bose restarts your warranty period. So if you have to send something back 1 month before the waranty, you get anotehr 11 months on top of that. Or, if you send something back to be repaired out of warranty, you get another full warranty for the item being repaired, which is standard 12 months. Excellent Speakers. Live sound and its extremely good. Bose speaker are mind blowing however Media center in is one of the worst product I have every seen in the home theatre systems. I have already faced several problems with the player as it fails to read most of my DVDs (original ones). Not sure whether the company is doing something to rectify this else it will be very difficult to survive. I am not happy for making a decision to buy this product. I always had problem when I wanted to demonstrate the product to my friends or relatives and I have faced enough embaressment. I have now moved this to my personal room from the reception. Its been good so far. I suspect taht the theater expereince will be profound. As of tongiht, the sound of music CDs has not impressed me. However, in all fariness, I've only played two rock disks, and I know that classical music sounds better on Bose systems than it does on many others. I don't know why, but Bose has always been able to produce the classical sounds fairly accuratly and clearly. Think about when you go to a rock concert. You don't feel the bass. You hear it, and sure you feel it some, but what you really feel is the drivers hitting you from the string instruments. I think Bose does a good ob of "faking" that realism. Many other "audophile" speakers will also sound a little "flat" w/o treble and bass adjustments, but that is "realistic" I guess. You can get used to it, except if you want to experience the mix on say something like The Prodigy's "Fat of the Land" when they do "Deisel Power." Then it's disapponting at lower volume levels. And while I'm at it, if you want a good pure rock speaker, go buy a couple 18" woofer Cerwin Vegas with two 5" drivers and two 3" horn tweeters, and STFU--lol. Also note that, and audiophiles may support this, that "real" sound is not the sound you hear from 99% of systems out there--with the bass and treble cranked to maximum. Normal sound does not sound like that. Bose does a good job of that sort of thing I think. Also note that the more power yougive them, the better they sound. If you crank the LS 28 up to about 70%+, you will feel the thunp of the bass module and the highs do become more clear. Note also that this is marketed as a "theater" system, not a "stereo" system. As stated, you could probably do much better with less money for pure music needs, although you will probably need much larger components too. Let me add one mroe thing since I ran out of space above. You can get the acoustimass series speakers for MUSIC mainly as a seperate speaker purchase. They have true midranges and tweeters, and I can attest (friend has one) that they do rock the world, great bass, good all round highs and mids. They are not self powered however. I think you can get the best one for 400.00 US. It's the same design as the LS series, with two cubes and a sub. They do sound good. The old LS series use to incorporate the same speakers as those, except the module was self powered. Now, the acoustimass LS series speakers are NOT the same as the Acoustimass non powered systems. Clear sound playing brass and string instruments. Small, easy setup for the basic set up, but not as easy as people say for a full TV-DVD set up. Gets pretty invloved. The average person will not have the patience or knowledge to set it all up like it can be set up. It's not bad sound even wtihout adjustments to bass and treble. It's loud when you crank it. Design is probably as nice as it gets. Muddy sound at lower volume levels. Just doesn't sound as tight as it should. Greatly improved at higer volume levels. Seems like with two bass drivers in the moduile, the bass should thump more at lower sound levels. Does not have BASS and TREBLE control knobs on the Acoustimass subwoofer module, like the old series did--bad mistake if you ask me. Does this system have midrange and tweeters or simply two tweeters per cube? Who knows because Bose is minimalist, even in its specifications of what exactly you get--lol. part of teh charm of Bose systems is thei minimalist approach, but maybe this time a little too minimal. One guys said that they use cheap parts and electronic wizardry to get away with a very inferrior product, then charge 10 times what it cost them. If true, that is shady. Remember too that if Bose was truly making junk and selling it for a price that was way out of line wiht teh market, they would not be in business, and they have been in business for over three decades. That being said, there are a lot of stupid yuppies with more money than brains when it comes to things like sound. So, perhaps stupid people that shop for sound systmes with their eyes, and not thei ears could be supporting Bose for all of these years? Go figure. Remeber two that most people agreed if the price were half of what it is for the LS series, then it would be a good buy. Best thing to do is listen to it along side otehr systems at a high end audiostore, adn tehn make up your mind. OK, here is the deal. First, I purchased the very first Lifestyle system Bose made. I think it was an 8 or maybe a 5 back in like 1994. It had the 135 watt subwoofer with two satellites, w/o the midrange. I listened to the old LS 8 with tweeters and midranges, and it sounded much better than the old system I bought, but I couldn't do the price back then. 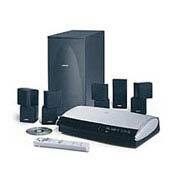 I payed 600.00 for that system from the Good Guys because my girl friend worked there while we were in college. The speakers WERE different then from now. That was 12 years ago. The old LS system I bought lasted 12 years and I had no problems with it, except the LEDs went out. I was never impressed with its build quality, but, like everyone else here, even the Bose haters, loved the design. Recently, I was thinking about getting the old system repaired, or tuned up, you know, whatever they want to gouge you for to fix any perceived and real problems. I talked to the service rep and the service was very professional and he knew his Bose systems well, even the old one I had, and he had all the specs ready for me too. Anyway, to make a long story short, he said they could not work on the subwoofer any longer because they didn't have the parts, but they could test the cubes and the media center, adjust the CD or replace it, and fix the LED lights, etc. The price is 200.00 flat rate which includes a 1 year warranty. He then said that Bose offers an upgrade to the new lifestyle systems if I wanted to return my old one. I figured it would be around 100-200 off the system I wanted, which was the L28. I wanted the L28 because I remembered 12 years ago that I REALLY wanted the speaker cubes with both the tweeter and midrange, not just the tweeters. However, I just could not justify 2500.00 US for the new system, given that my old LS system performs well and I could have it fixed for 200.00. Well, the price was 1265.00 US for the new LS28 with my old trade in. They gave me five wall mounts for free also, which are 30.00 US each. So I cannot complain about their service in this situation. They were good to me. My old system was I think 135 watts and had a little tiny subwoofer. It thumped like hell. No, it wasn't your audiophile brag box, but even my audiophile friends were amazed by the sound that came from such a small unit. I mean the entire thing almost fit into two shoe boxes. So yeah, like one guy said, Bose can work some F-ing magic with small components, even if the speakers are nothing special before their electronic wizardry. Anyway, the L28 is rated at 350 watts, and I was REALLY ready to hear what the "new" 350 watt Midrange and Tweeter and huge subwoofer LS28 would sound like compared to my little LS 5 I bought 12 years ago. I ran the wires through my roof, mounted the wall brackets, and set it up through the wall professional style with ceiling groments and high heat wire covers. Looks sweet as hell. Almost completely out of site. Like sound is coming out of the walls, not speakers. The only thing is that the new speakers sound like they were made out fo wall board. I know you thought I was leading up to a great review, but I'm not. The cube speakers don't sound clear and defined, but rather muddy, even muddier than my single cube Old LS 5 system did. I just can't seem to hear enough treble. Another problem is that, even though you can adjust treble and base for DVD playing, I cannot figure out how to adjust it for CD Music playing. The old "Acoustimass" which is Bose's name for the self-powered subwoofer on the LS systems, had both a treble and bass knob. On my old system, they were both turned up about 90%, which took much of the muddiness out of the sound. You know, it seperated the highs and lows better. That's without pouring the power to them. You want some bass and treble, pour the sound to those Mother F-ers. I mean like crank the Sh**t out of them. Let them breath a little and push that 350 watt module. I mean change its pitch up, smack that b|tch up a little guys (and gals). Now you have some thumping bass and some decent highs, but still sounds muddy in the midrange. A treble control may fix this. After doing some serious listening, I don't think the LS series has a midrange. I think all five cubes are dual tweeters. This makes sense for souround sound DVD movies, however, as the sound can be bounced off the walls for a better surround sound. It is NOT a good idea for excellent music reproduction, or clear highs and mids. I have emailes the rep that helped me, and asked him if there is both mid and high on the cubes, but I'll bet you dollars to doughnuts that they no longer have the mids. Note also that I have not run the built in fine tuning system yet, so the system is not completely tuned. If I can get the treble and bass up, then I may be more impressed. Let me also say that my old LS 5 system sounded the same way without turning up the treble and bass knobs--just kind of muddy and not enough bass--but if you poured the power to them, they would put out, like the LS28. The problem is that we don't usually listen to music at 169 decibles all of the time. I usually listen to my music at about 30-40%, which is a good background level while still focusing on the music. For comparisons, I had a high end receiver back in the early 80s, with some nice 1000.00 Klipsch speakers, about 3 feet tall and 2 feet deep, and they sounded the same way without bass and treble adjustments. But they were crazy accurate. Still, the sound does have its realistic aspects. Horns and strings sound great. Another Bose tradmark. I just thought that tehre would be no comparison with my old 135 watt system to the new 350 watt system wth 3 times the subwoofer area and 8 times the cube area (2 cubes compared to five dual cubes). But as of today, I can't hear it, except when you turn up the system, where is does come alive somewhat. One thing I've noticed with Bose is that you can really crank their stuff and it will take it, since it is like they say, a balanced system. Now, since I was a child of the 70s, let me give you some Bose history because I really don't think the company is evil, and they are pretty fair, except their prices, and prodiced some REALLY nice stuff in the 70s. Enter the Bose 901 series 1975 model. If you have a chance to pick some of those up, do it. Those speakers will blow you and your neighbors away for about 3 blocks. The realism is excellent too, but again, they lacked bass. However, for horns, strings, and the like, you could be fooled into thinking that a live band was playing when in fact the 901s were playing. Again, you had to lay on them to get them to put out, or you got a sort of tinny sound from them--a Bose trademark. I heard even back in 1979 that the new line of 901s was no match for their old ones. I cannot confirm that. If you listen to them in a show room, make sure its about 40 feet long and 40 feet wide, because you will need that much space to accurately understand what the 901 is all about--given that the quality is back again to what it was in the mid 70s. It's the definition of "loud speaker." Seriously, those old 901s my friend brought back from Veitnam could literally blow your eardrums in a 20x20 room if you had the power. Their power rating was, uh, unrated power. Yep. And they meant it. My conclusion is only tenative. I need to get some feedback from Bose and run the tuning system. But I still don't think anything can make up for the muddy sound of not having enuogh separation between the highs, mids and lows. The sourround sound works well, even with music CDs--I have not tried movies on DVD yet. But the way this system is set up, I would not be surprised if the theater aspect is beyond good. It seems like the LS series are much more in tune with a theater experience rather than produing seriously good music, like the old LS systems were. I seriously thought, "Uh, I want my old system back" when I first turned the on the LS 28. This is a strong point from my expereince and my sisters--she still has her LS 5 from 1994 and had it serviced about two years ago. Bose 301s, 401, 901, and the non powered Acoustimass series speakers. Klipsch, Yamaha, Cerwin Vega speakers. Very nice looking and smooth sound. Trust me bealive me you can do much much better with that kind a money. Bose is good don't get me wrong but not in that price. Over $2000 you can make a killer system. It would be better if the price is under $1000. That is all I can say. Happy listening. Any Home Theater under $1000.